The Jim Henson Company’s Living With Dinosaurs originally aired in the UK on December 30, 1990. It was shot in Wembley at Lee Studios in London, and on location in Suffolk and Southwold, England. The 53-minute television program was written by Anthony Minghella, with musical composition by Rachel Portman. 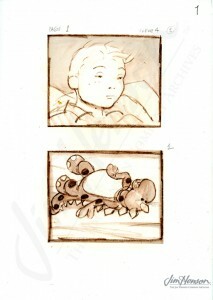 Anthony Minghella had written all of the scripts for Jim Henson’s television program The Storyteller before writing Living With Dinosaurs. Following his involvement with Jim Henson Productions, he would write such screenplays as The English Patient (1996) and The Talented Mr. Ripley (1999). 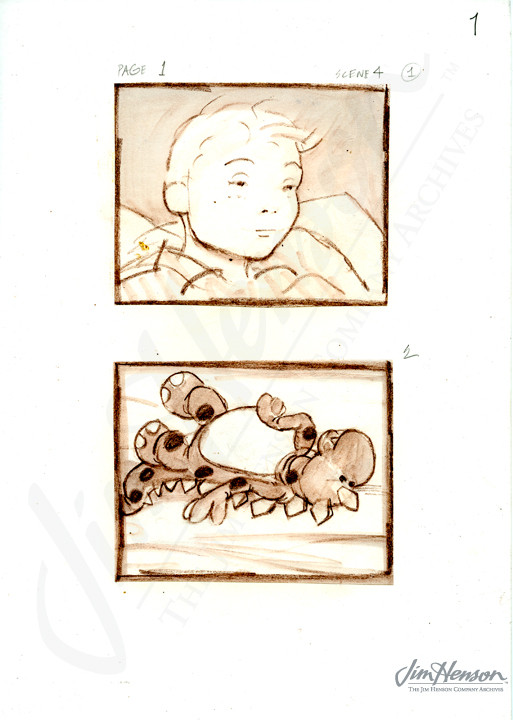 Rachel Portman had also composed the musical scores for The Storyteller. After Living With Dinosaurs, she would go on to have a prolific career in film, composing the scores for such films as Jane Austen’s Emma (1996), The Legend of Baggar Vance (2000), and Mona Lisa Smile (2003), and continues to compose today. 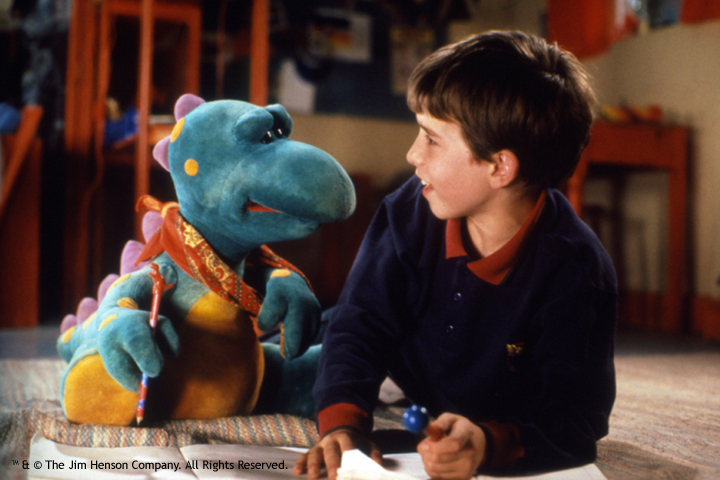 Living With Dinosaurs is a story of Dom (played by Gregory Chisholm), a boy about to turn ten who feels confused and frustrated about his life. 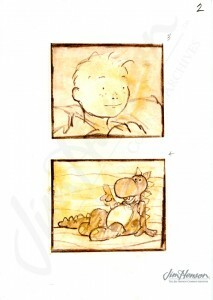 His stuffed dinosaur, Dog, a puppet performed by Brian Henson, helps him through difficult times. Much like Bill Watterson’s tiger Hobbes from Calvin and Hobbes (which was a staple in the comic sections of newspapers all over the United States by the time Living With Dinosaurs was filmed), Dog comes to life when no one else is looking. Not only does Dog help Dom with the difficulty of entering a new school where his bullying cousin attends, but he also helps Dom with his confused feelings about having a full-time working mother and a stay-at-home artist for a father, who are expecting another child. Dom is also asthmatic, and in this 1988 production this is portrayed as a weakness to further alienate Dom from his peers. While Dom’s character outwardly uses sarcasm to deal with his feelings, Dog is genuine and earnest, and often provides comedic relief. He guides Dom to help him grow and accept his parents for who they are, and has a special love for singing Elvis songs. Eventually, Dom’s father finds outside work for his wife to be able to stay home after the new baby is born, and Dom makes peace with his cousin. And on his tenth birthday, he significantly leaves Dog at home for the first time in the story, rather than carrying him along with him. After Living With Dinosaurs aired in the UK, it was re-formatted to become an episode of The Jim Henson Hour. Premiering on April 14, 1989, The Jim Henson Hour aired nine episodes on NBC, but was cancelled before the final three episodes could air- one of which was The Jim Henson Hour’s reformatted version of Living With Dinosaurs, which had originally been scheduled to air on August 13, 1989. 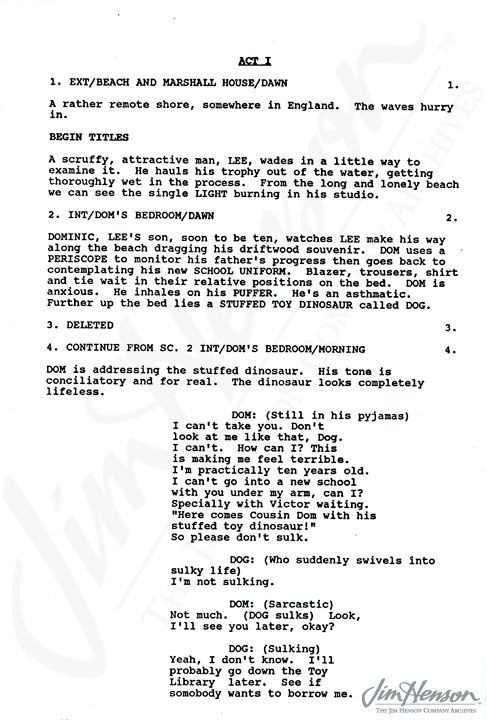 In 2000, a pilot script was written for a new series based on Living With Dinosaurs, but it was never produced. See Dom and Dog in Living with Dinosaurs. Dog as he appears when only Dom is looking. Gregory Chisholm as Dom, with his Dinosaur, Dog, 1988. First page of transcription script for American audiences, 1989. 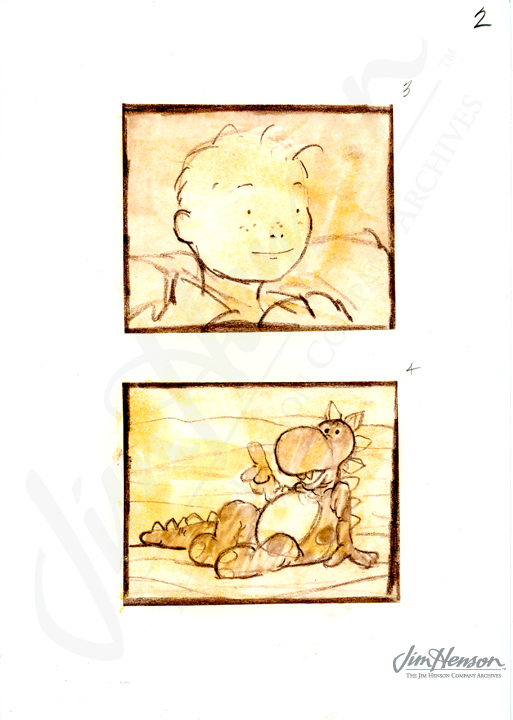 This entry was posted in 11-November '88, 1988, Jim Henson Hour and tagged Brian Henson, Living With Dinosaurs, Rachel Portman, The Storyteller. Bookmark the permalink.